THIS 4-DAY SMART DISTRIBUTION NETWORK COURSE COMBINES OUR 2-DAY DISTRIBUTION AUTOMATION COURSE, PLUS A 2-DAY DISTRIBUTION NETWORKS ANALYSIS WORKSHOP USING CYMDIST DISTRIBUTION AUTOMATION SOFTWARE. This 4-Day Smart Distribution Network course combines our 2-Day Distribution Automation course WITH a 2-day Distribution Networks Analysis Workshop Using CYMDIST, which provides students with a practical understanding of energy consumption, power distribution systems operation and control, the technical challenges that power utilities currently face to accommodate distributed generation in their distribution networks, and the most recent interconnection requirement standards of distributed generation in North America. The course also provides participants with the required knowledge to understand, assess, and analyze the technical and economical needs of adopting Distribution Automation technologies to mitigate such technical challenges and enhance the operation and reliability of power distribution systems. This course covers topics related to the transformation of power distribution systems from their conventional structure with unidirectional power flow towards smart distribution grids. Our 2-Day Distribution Automation course provides participants with a practical understanding of energy consumption, power distribution systems operation and control, the technical challenges that power utilities currently face to accommodate distributed generation in their distribution networks, and the most recent interconnection requirement standards of distributed generation in North America. The course also provides participants with the required knowledge to understand, assess, and analyze the technical and economical needs of adopting Distribution Automation technologies to mitigate such technical challenges and enhance the operation and reliability of power distribution systems. The deployment of distributed generation, energy storage, and electric vehicle charging technologies is creating a paradigm shift of the way distribution networks are planned, operated, and analyzed. Distribution system engineers are now required to perform wide variety of complicated studies ranging from planning analyses to expert simulations supporting operations, including interconnection assessments for emerging technologies such as distributed generation, energy storage, and charging stations of electric vehicles. This 2-Day Software Workshop provides participants with hands-on training using CYME distribution system software tool (CYMDIST) in order to analyze evolving distribution systems. CYMDIST is a powerful tool used by most power utilities and consultant firms in Canada and worldwide to model power distribution systems. The software is superior in addressing the simulation needs for capacity, contingency, power quality, protection, reliability, and optimization analyses in evolving distribution systems. This 2-Day Workshop explores how to implement the fundamentals laid out in our Smart Distribution Automation Course (www.electricityforum.com/electrical-training/distribution-automation) fundamentals using EATON CYMDIST software. CYMDIST is the distribution system analysis base package of the CYME software. 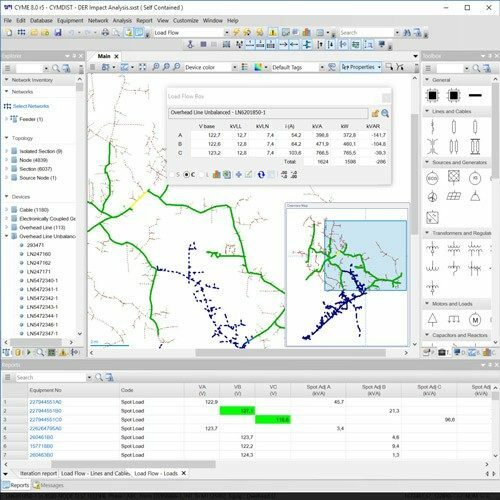 It bundles all the modeling and analysis tools required to perform various types of simulations involved in electric distribution system planning. The calculation engines support balanced or unbalanced distribution models that are built with any combination of phases and operated in radial, looped or meshed configurations. The modeling capabilities of the network editor of the CYME software include the detailed representation of all portions of a distribution network, including the MV primary system, the LV secondary system (radial or meshed) as well as the subtransmission system. The registration fee to attend this training course is $1399 + GST/HST. Register 3 delegates at full price $1399, and get a 4th registration FREE! This course earns 2.8 CEUs. We can present this Combined Distribution Automation Course AND CYMDIST Workshop Course to your electrical engineering and maintenance staff, on your premises, tailored to your specific equipment and requirements. We are ready to help design this program for you. Click on the link below to request a FREE quotation.